Captain Frank-Uwe Schneider started his maritime career in 1980 and learned his job by working his way up from the bottom. He sailed on a general cargo ship until he joined the Maritime Academy Rostock in Germany where he graduated in 1992 with a university degree. After sailing 6 years as an officer he finally took over his first command as Master. In 2002 he decided to take over responsibility ashore and joined the Rickmers Group in Hamburg/Germany as responsible ISM manager. Two years later he was promoted Managing Director of the Crewing Company and was in charge for crewing, training and development of the international agencies. 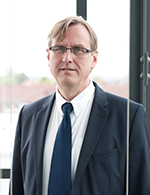 After a short interlude as Managing Director Crewing in the German Dr. Peters Group he joined REEDEREI NSB in early 2012 as Crewing Manager where he developed an international network of crewing companies as well as the international officers training within the NSB GROUP. With subsidiaries in Shanghai, Colombo and Manila NSB today is in the position to organise the crewing for the own fleet and for customers worldwide on a high quality level. While working more than 10 years with Chinese crew he is very experienced in all pros and cons of this market. The 52-year-old German lives close to Hamburg is married has three children and one grandson.